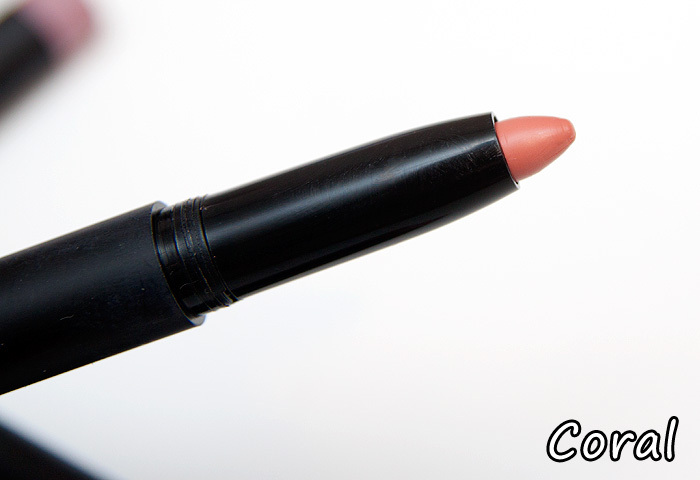 A Makeup & Beauty Blog – Lipglossiping » Blog Archive Starting out? Build your stash without splashing the cash! Are you developing a love for makeup? Perhaps you’re taking the first steps into building a portfolio of colours and textures that you love but you’re apprehensive about wasting a ton of money? Let me help your build your stash without splashing (too much) cash! It can be hard to find a secure footing amongst the myriad of beauty products at your disposal. A full spectrum of shades, although useful… can be intimidating to anyone new to the world of beauty. I can’t even begin to tell you the amount of makeup that I’ve passed on to friends and family over the years, I must have wasted hundreds upon hundreds of pounds in the never-ending quest of finding my happy-ever-after products. I’m not there yet, but I can advise you against a number of pitfalls that you might encounter along the way. Grab a cup of tea, sit back, and let me guide you through the trials and tribulations of feeding your makeup addiction. Believe it or not, when I started building my makeup arsenal, beauty blogs simply didn’t exist (quelle horreur!) I had to rely on magazines telling me that Maybelline Great Lash would do epic things for my lashes… can you even imagine?! Needless to say, when it comes to trends and aspirational imagery, mags are hard to beat… but when it comes to how products work on real skin, blogs and forums are the way forward. Do your research. Nowadays, there are a billion (and one) beauty blogs at your disposal and most are getting pretty savvy with their search engine optimization. 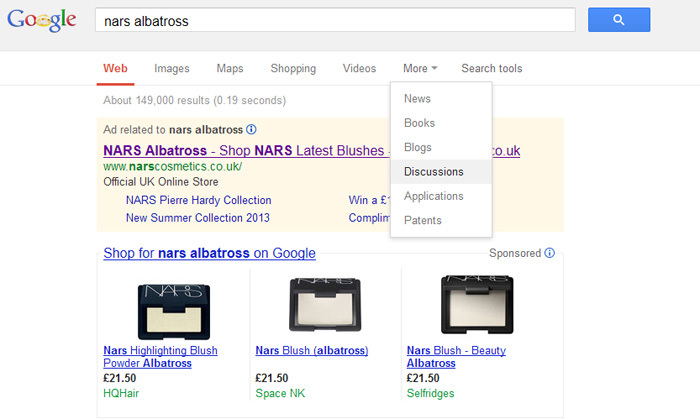 A simple query into Google should throw up some useful results about most products but don’t forget to dig deep. Once Google has returned your standard search results, expand on this by searching “discussions”, “blogs”, and “images” to ensure that you get the full lowdown on the product you’re interested in purchasing. It doesn’t take long to do some sleuthing on a product before purchasing and I rarely regret a purchase that I’ve checked out online beforehand. Infact, almost all of my regretful purchases come from that impulsive urge that grabs at my purse at won’t let go! You might expect me to tell you not to purchase shades that you already own. Nuh uh, not me. I’m one of many “queens of taupe” in the blogging world, which basically means… me and taupe, we got a ‘thang’ going on. Do I regret owning 30 subtle variations of the same shade? Do I hell, I love each and every one of them. It’s those hot pinks I like looking at but never wearing that need trimming from my collection. The thing is, we’re creatures of habit us humans. We know what we like and generally, we stick to it. Why fight it? If you know that you love green eyeshadow and wear the shade daily, stock up in different textures. Buy what you will use the most and don’t be ashamed to do so. Just be mindful of becoming an obsessive hoarder… you don’t want your cat to dig your dead body out of your collection of purple eyeshadows one day. Not cool. There are so many wonderful sources of cheap makeup online nowadays, you simply don’t need to rush to your local NARS counter to make that initial purchase. If you’re wanting to dabble in red lips… don’t start off with MAC’s Ruby Woo. Yeah, yeah it’s an iconic shade that every red-lip lover must own before they can even call themselves a makeup fan. Pfft. You won’t be saying that if it turns out you look like Ronald McDonald on acid with anything bolder than “subtle rose” on your lips will you? For me, as much as I feel like I surely need to own the classic MAC Vegas Volt… I really, really, don’t. You know how I know this? Every. coral. lipstick. ever. If you find yourself hankering after a high-end, uber lustworthy piece of makeup, do the sensible thing and search for dupes first. Ok, this advice isn’t so pertinent if you know that the broad shade range is a good match for your skin-tone (coral is so unkind to me!) but still, you hear what I’m saying. Once you’ve got that dupe down, head for the cheapie sites. Cheap Smells, Fragrance Direct, ELFCosmetics, you know the score… then once you’ve filled your basket with the shades you’ve been desperate to try? Who’s gonna bat an eyelid if you add one or two extras to broaden your makeup-loving horizons. Ask yourself this simple question: What is it that you actually need? Grab an empty makeup bag and plan your face from base to finish. Where are the holes in your collection? Which aspects of your finished look are letting you down? This is a question that you can ask yourself regardless of how developed your stash is. For me, I still need to pay attention to priming my face instead of blaming an unsatisfactory outcome on a rogue foundation. I know, that if I put more effort into providing my base products with some solid groundwork, I can improve their performance by 50% easily. Be realistic. Are you blaming your dehydrated lips on your latest lipstick purchase? Perhaps instead, you should blame them on your lips! I could never wear a matte lipstick before I discovered Lanolips. Nowadays I fully take it for granted that I can wear whatever the hell I want on my lips so long as I prepare them adequately and keep them nourished with the proper products. I think that it’s often a lot easier to lay the blame for a disappointment on the cosmetic than it is on your own beauty routine. Be honest with yourself and make resolving any underlying issues with your skincare a priority. In the end, your bank balance will thank you for it. I’ve said this so many times before, but if you’re shopping a counter… please don’t be afraid to ask for assistance. I know, you know, we all know that the beauty hall can be a scary place but it’s the job of sales assistants across the world to assist you in your purchases. Sure, they’re there to make sure you purchase as much as your bank manager can handle before going into a meltdown but more often than not, they also have some nifty tools at their disposal to genuinely give you the best advice possible. 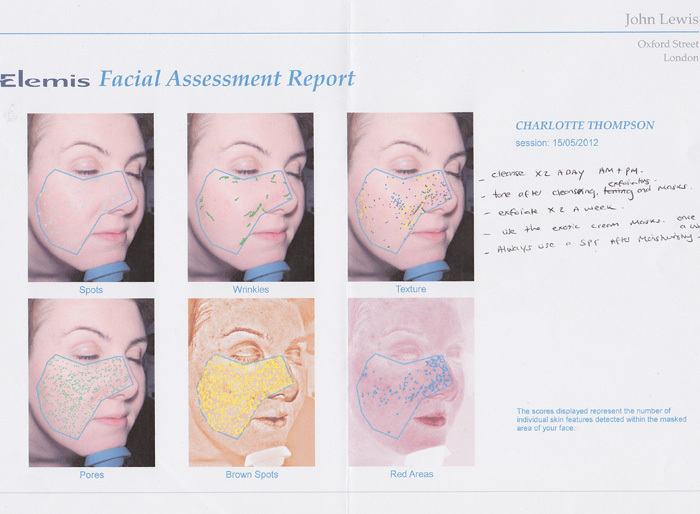 One of the most useful things I’ve ever done was have a skin assessment at an Elemis counter. With the help of some high-tech machinery and a knowledgeable sales assistant, I learnt more about my skin in 20-minutes that I’d managed to self-deduce in a decade. It really changed how I viewed my skin, and cemented an action plan that I still work from to this day. How much did it cost me? Nothing, apart from the obligatory guilt-purchase from using up the SA’s time (about £14). The same goes for less high-tech offerings such as a professional eye for a foundation colour-match. Sure, there are numpty sales assistants out there who’ll swear blind that your NW15 skin looks great in shade TANGO but shop around carefully and you’ll get some great advice from some properly trained and truly talented makeup artists. Not only that but you’ll pay a 10th of the cost for the privilege were you to hire the exact same people to do your special occasion makeup. I hope this helps you explore some nifty ways on how to build your stash of makeup without bankrupting yourself in the process. Please do share any tips that you have, I’d love to read them! Vegas Volt is mental coral – nothing like the ELF one in the picture! 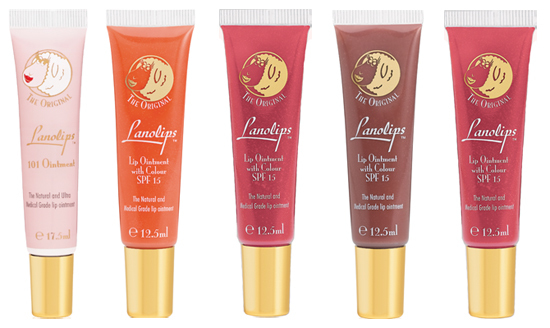 Lanolips is good for hydration but finally caved and got lush lipscrub which is awesome! Quite right but I didn’t call it a dupe? I can’t wear any coral lipsticks, so it makes sense to try a cheapie one before splashing out on something more expensive. Perhaps I misread your coral comment – I got that all corals are the same so buying a cheap one is representative of buying a pricey one. Not sure I agree – like reds, corals can have different tones so I can’t wear some reds but blue tone reds do work. Also cheap lippies don’t have the depth of pigment so perhaps if a cheap one doesn’t work -a better quality one may look better. I’ve never heard of a blue-toned coral though! Ahh wear it with pride! I keep thinking the same about Girl About Town! Great tips for how to get your private collection of make up on without emptying your bank account in the process 😛 and of course people should ask for assistance. I mean, we can’t be experts about everything, right? 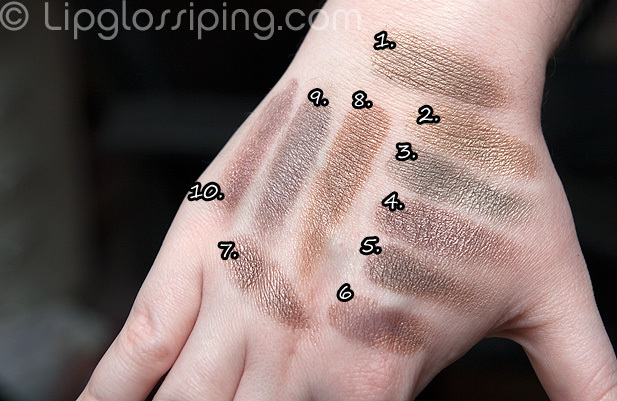 Where is the taupe swatch key/legend?? As another taupe-aholic, I am dying to know which is which. This has made me feel better about my collection of purple eyeshadows, because I do wear them and I have nowhere near enough to bury myself in! Those are some excellent tips… which I can say since I already employ them 😀 . Research, research, research, and then first go cheap. Fiery orange, fire engine red, mauve, brown, plum, hot pink, neon red, coral, brick red… lips? And that’s how I know raspberry is for me, plum is for me, oranges… not so much. I do have a ton of blue nail polishes, but I love each and every one of them. + They were bought on the cheap, so that helps, too 😛 . Things wot I did like last week.